(BRIGHTON, MA) — On Wednesday, July 25th, Governor Charlie Baker and Undersecretary Janelle Chan of the Massachusetts Department of Housing and Community Development (DHCD), announced the 2018 annual affordable rental housing funding awards. B’nai B’rith Housing’s Phase 2 of its Coolidge at Sudbury development was one of the 19 funding recipients. The complete list of funded projects was announced at an event held at the site of fellow recipient Hearth, for The Hearth at Four Corners development, at 16 Ronald Street in Dorchester. “The lack of affordable housing [in Massachusetts] is hurting our young families, our growing workforce, and our older adults; it is forcing lifelong residents out of their neighborhoods; and it is our biggest roadblock to continued economic success,” said Governor Baker. Funding from the DHCD is an exciting next step bringing BBH closer to breaking ground on Phase 2 of The Coolidge. The new development, which will be located next to the fully-occupied Phase 1 property, will include an additional 56 affordable units for seniors. The building will feature common spaces such as a meeting room, library, and fitness center. In keeping with BBH’s high quality, service-enriched housing model, residents will have access to an on-site resident service coordinator who will continue to partner closely with Sudbury area senior-service agencies to promote wellness, health, and educational programs for the all the residents of the building. Prior to the development of Phase 1 of The Coolidge at Sudbury (completed in 2014), affordable housing for those 55 and over did not exist in and around the town of Sudbury. With over 25% of Sudbury households having at least one member who is over 60 years old – and 30% of Lincoln-Sudbury senior households earning less than $50,000 per year* – the need for quality, service-enriched housing was critical. (*2000 U.S. Census, localized data set). 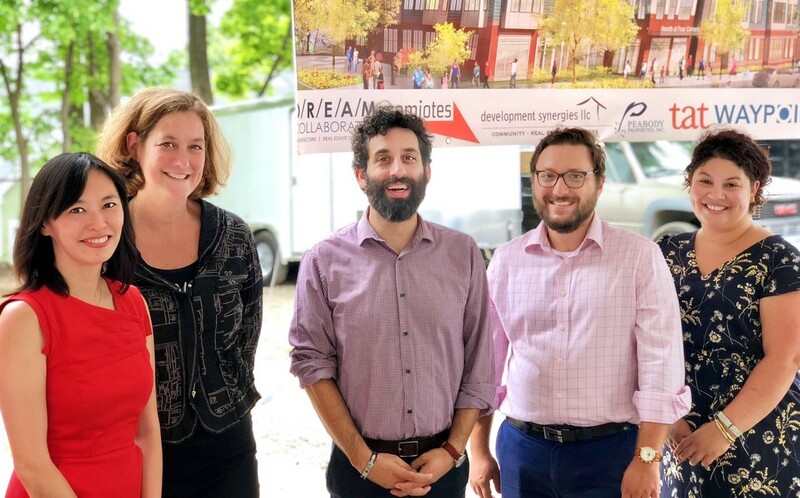 DHCD Undersecretary Janelle Chan with B’nai B’rith Housing Executive Director, Susan Gittelman, Senior Project Managers, Jesse Kanson-Benanav and Max Glikman, and Fundraising & Communications Manager, Naomi Levine at Wednesday’s event. Among the commitments, BBH will receive Federal and State Low Income Housing Tax Credit (LIHTC) funds, State HOME funds, Affordable Housing Trust Funds, Housing Stabilization Funds, and other support. 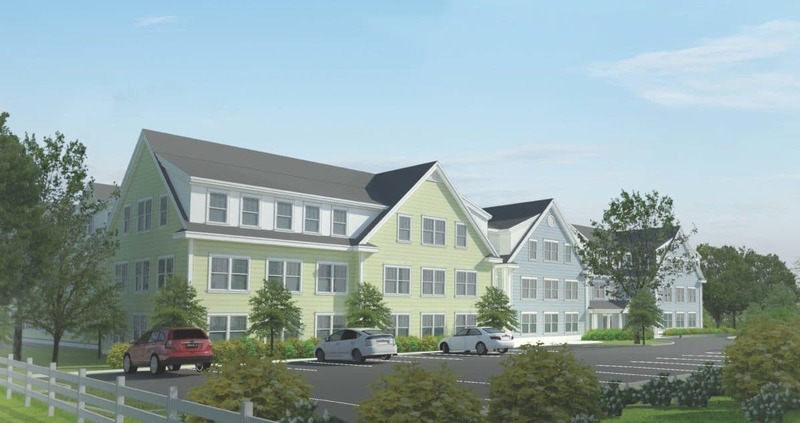 “We commend the Baker-Polito administration for making affordable housing a priority and we are grateful to the DHCD and the Town of Sudbury for supporting this project,” remarked Gittelman. B’nai B’rith Housing (BBH) is a regional nonprofit housing developer whose mission is to ease the housing crisis in the Greater Boston area. BBH works with cities and towns to create economically viable, affordable housing options which respond to the needs and aspirations of each community. BBH’s award-winning housing developments, both rental and homeownership, are for young families and older adults, regardless of religion or background.